Kaitlyn Sherrad was out on her own from the protective shield of her parents. She wants to experience life all the while searching for her uncle that had disappeared right before she was born. Kaitlyn will be distracted when she meets Zach Ravenscroft who was a casino owner. There will be an instant attraction that will consume the couple but there will also be a danger that lurks in Kaitlyn’s shadow. Bound by Blood is the second and final book to the series Bound by Amanda Ashley. I thought this was a good book to read. I liked that Amanda Ashley wrote about Elena and Drake’s daughter who was a little different. Kaitlyn’s character was a half breed which was half human and half vampire. I liked that she was different than the average vampire as it gave the story something more than just a vampire book. I liked Kaitlyn. She was strong willed, a little spoiled but was a good woman. Zach might be a player but he certainly didn’t act like it especially when he saw Kaitlyn. Now Zach is a vampire but he is also a little different type of vampire. His kind is called the Others. He is able to make a vampire. For Drake’s kind the vampires are born. There was without a doubt a villain which was one of the wives of Drake’s father. She wanted revenge and was after Kaitlyn to get that revenge. Towards the end there will be a surprise that involved Kaitlyn’s family. The situation would have been very sad if the tragedy occurred, but Amanda Ashley made sure that a happy ending happened. Elena knew that she needed to leave before her uncle took his advances any further. She will escape to the broken down castle which was abandoned though she will find out that is not exactly true. Drake lived in the abandoned castle all alone until he finds a woman seeking shelter. He will let her live there to protect her from her uncle, but he will find that there are other things that will become a problem with her being there. Bound by Night is the first book to the series Bound by Amanda Ashley. I liked the book, it was a book that went by fast for me. I felt that in the beginning of the book the story resembled Beauty and the Beast, which I liked. So vampire books are all very different and I like when author’s give the vampires a little something different than the classic myths. Well most of the facts about these vampires were from the classics but there were a couple differences. One difference was that taking blood didn’t need to be done everyday or in their case every night. Elena’s character was for the most part scared and a little weak but that was only till she found the courage to get out of a bad situation. She is resilient but in the world that she will be thrown into she wouldn’t be able to handle everything that comes her way. Drake’s character was a vampire that didn’t want to follow in his father’s path. He didn’t like the ways of the old. I liked that about Drake and loved that he wanted to be with Elena more than anything though there will be plenty of ways that will make it difficult. I am reading the second and final book to the series next which will be with Elena and Drake’s daughter. So I haven’t posted anything for a while now because I have been on the task to read an entire graphic novel collection, which has 12 volumes, and these are not small comics. The majority of the volumes are 200 hundred pages worth. The graphic novel series I decided to try was the Sandman. This series had been recommended to me awhile ago and I had decided now was the time to try it out. 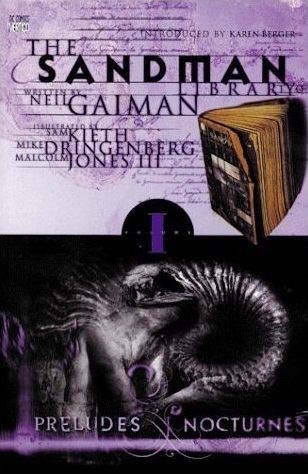 I was told specifically to start at the beginning of the series with volume one, The Sandman: Preludes & Nocturnes. This series is written by Neil Gaiman. Well the story is basically about this man who wants immortality and decides to imprison Death. Though something went wrong and they captured Death’s brother. Dream was captured for a human’s lifespan but then will find a way to get out of the prison. Now that was just the first volume. Things will continue with the character Dream and Death. There were will many stories that will interconnect and many of them are definitely weird. Alright first thought about the graphic novel series was that I liked but it did not start out like that. I will say the beginning I felt lost and confused with the story. I was like that with the other book that I read from Gaiman which was Stardust. I had liked the book, but I liked the movie better, though it definitely was strange. He is not an author I would run to read but every now and then try I would try another book. Well back to the graphic novel, so I was able to get into the stories and follow along through all the dialogue, and there were some stories that I really liked. Some stories were more on the gruesome side which surprised me. I found that with reading the graphic novel series the illustrations reminded me of the old comics which I read when I was a kid, and that made sense as the majority of the stories were published in the 90’s. So overall I thought that the Sandman series was worth reading and Neil Gaiman created a strong fantasy world where many strange things happened. Wrath is the King of his people. It has been a privilege and curse and it has only gotten worse. The kingdom is being taken from Wrath, which got Wrath thinking that maybe that would not be a bad thing especially if being King meant he would have to give up the woman he loved. 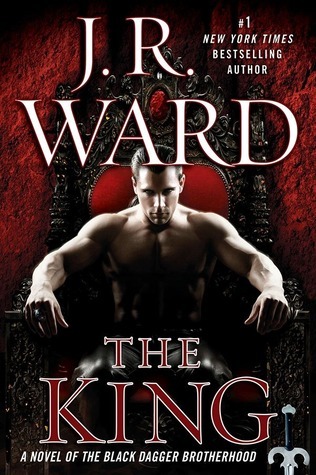 The King is the twelfth book to the series Black Dagger Brotherhood by J.R. Ward. I thought that this was a very good book. Normally in series the author doesn’t give the main characters another story but Ward did. Wrath and Beth will be the main characters in this book just like the first book. As stated above Wrath’s kingdom is in danger. Though there is another situation that will have Wrath scared which is Beth’s need for a baby. Wrath doesn’t want a baby because that would endanger Beth who was more important to Wrath. I liked how Ward continued Wrath and Beth’s story. They were obviously happy but there were some problems that they had to work through. I liked that their story wasn’t just with them happy and everything is going great as that would be unrealistic in a marriage. There are definitely ups and downs in any marriage. Now in the book I noted that Beth wanted a baby and she will get her wish, but with her being a half breed some things are a little different for her that I thought was interesting. What I also liked was the ending. Again it was a little corny and sappy but with everything that had changed within the book I wanted that type of happy ending. So there is one more book that is ready to be checked out at my library but I am going to take a break from this Brotherhood. This series has been very good but I will say it can get overwhelming with all that is happening. I am going to take a break and come back to the thirteenth book which will be with Trez.